This was a property adjacent to Benthall Hall which is a historic building owned by the National Trust near Much Wenlock. Many of the buildings in this town date back hundreds of years including Benthall Hall which is recorded in the Domesday Book of 1086. 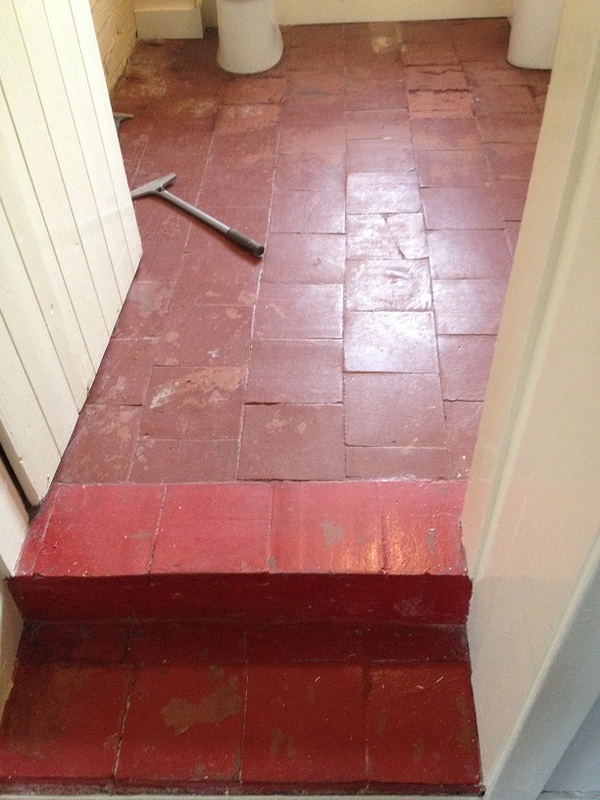 The property hadn’t been lived in for several years and the new tenants wanted to sympathetically improve the look of the Brick Shaped Quarry Tiles on the lounge floor and in the toilet where the floor had been laid with nine-inch square quarry tiles. Both floor areas had been painted over previously and due to dampness issues the paint was flaking off leaving a very unappealing look. No doubt this contributed to the reason the property has been left un-occupied for so long. To give the floor a deep clean I would need to remove all the flaking paint; there were several ways I could go about this so after some consideration I decided to try Tile Doctor Remove and Go. Remove and Go is a multi-purpose coatings remover that can strip sealers off tiles as well as remove paint and other coatings, it’s also designed for use on Tile, Stone and Grout so safe to use. I applied a strong dilution of the product to the floor and left it to soak in for a good ten minutes. It was then scrubbed into the floor using a black seventeen-inch scrubbing pad fitted to a rotary floor machine. The floor was then rinsed down with water and the soil extracted using a wet vacuum. With the floor clean I could see I had been successful in removing most of the paint but there were areas where further work was needed and so I repeated the process three or four times and used a steamer on the stubborn areas until I was happy with the condition of the floor. After rinsing for a final time, I inspected the floor and could see the tiles looked a hundred times better. 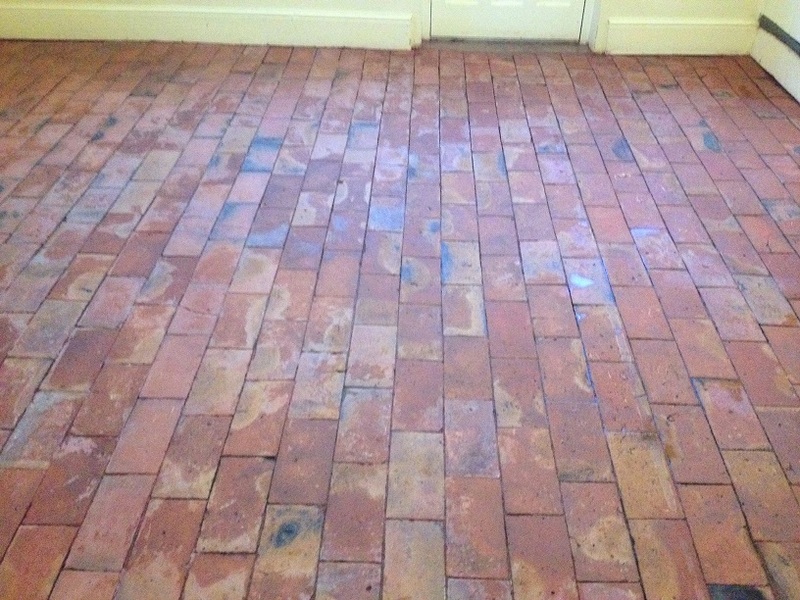 My next thought was to seal the Quarry tiles to protect them from future staining and enhance their look. 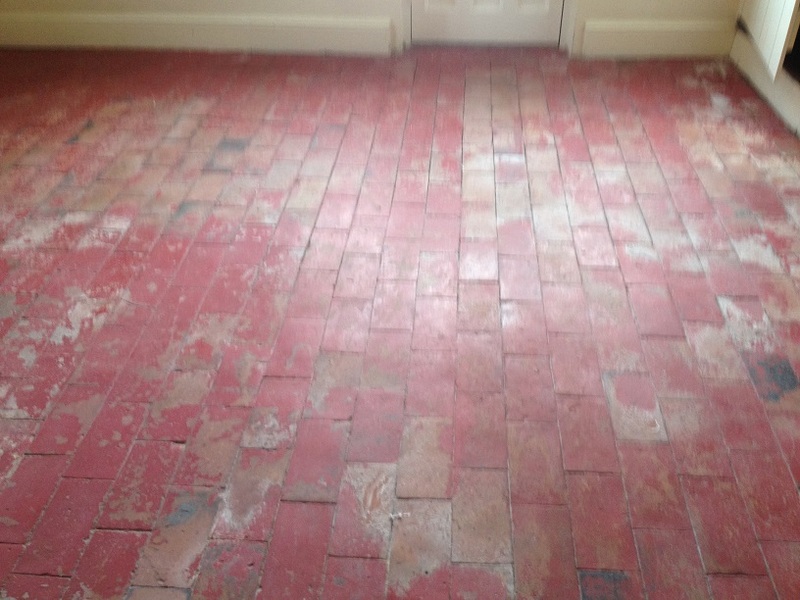 The problem however with old floors like these is that they don’t have a damp proof membrane and can have damp problems. The floor needed to be dry before applying a sealer and with all the water used to rinse the floor it may take some time to dry out. I discussed this issue with the customer and we agreed that I will return to monitor the floor and arrange to seal it when it was dry. In-fact I did return after a week and tested the floor with a damp meter which confirmed the floor still was still too damp. They were due to move into the property in a months’ time, so I visited them again to check the floor and unfortunately the damp level was still too high. 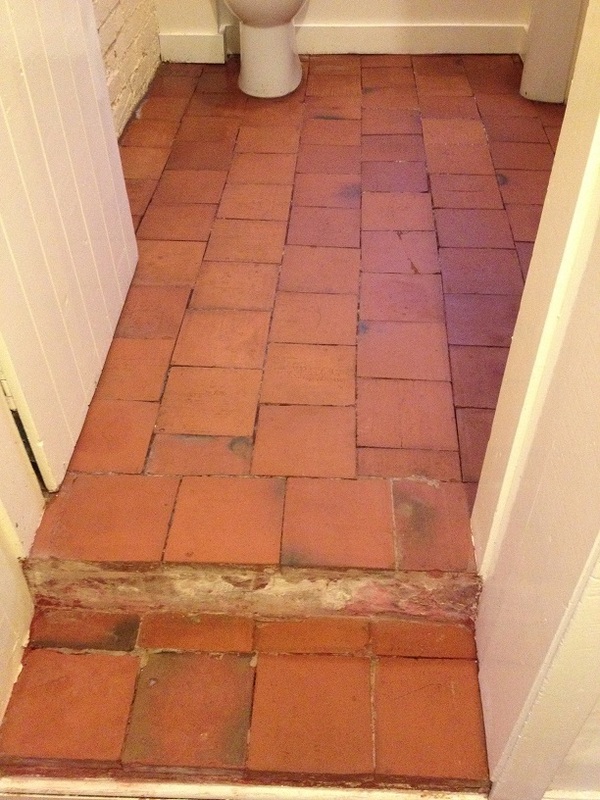 I concluded that there were several factors preventing the quarry tiles from drying out: the tiles were laid on sand, the property as I mentioned had not been lived in for years also there had been a lot of rain over the last couple of months. We agreed that once they move in and start to heat the building up, the floor have a much better chance for drying and when it looks dry, they will give me a call and I will check it for them and seal it if possible. Given the damp issues my thoughts are to seal the floor with a coat of Tile Doctor Colour Grow and then finish with Seal and Go Extra, both are which breathable sealers and will leave the floor with a nice sheen finish.